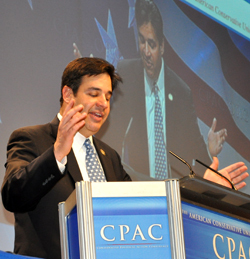 Raul Labrador, U.S. Representative from Idaha, was born in Puerto Rico. As a Latino, he opens by taking note of the diversity represented by the speakers present today. He gives a stirring story about coming to the U.S. and the very difficult choices his mother faced. In 1981, his mother registered as a Republican. 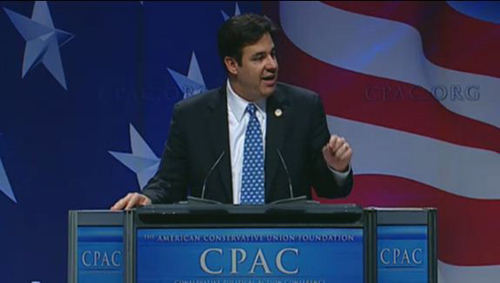 Labrador talks about his accomplishments in the Idaho State legislature. He faced a "blue dog" democrat in his election and was pro-business, pro-gun. However, he supported Nancy Pelosi and supported a large part of the liberal agenda. His opponent was considered the "least liberal" democrat in congress and the conventional thinking was that Labrador could not win. Labrador was outspent 6-to-1 in his race, but he still won it, by 10 percentage points. He won on the message - messages of fiscal constraint, individual responsibility, sanctity of life, the power of the family, the need to protect the second ammendment, against over-reaching by the government, and about freedom and the uniqueness of America. Rhetoric is great, especially with expensive consultants. In fact, if you weren't paying attention closely, you'd think Obama is now a conservative! Liberals are now saying Obama is the next Reagan! But Obama's actions speak louder than words. He is not a conservative. Just watch his actions. What was true under President Reagan is still true today - entrepreneurs and small businesses are responsible for growth in the US. Not stimulus, not government spending. Almost every business owner tells Labrador the crushing regulatory burdens they are under. Most incomprehensible are the waivers granted under Obamacare. Who are getting these? Union dominated organizations who helped Obama get elected! Labrador says if we simply keep the promises we make that got us elected, the American people will trust us and we will get re-elected and we will win the U.S. Senate. Hold our feet to the fire.